ATTENTION: These pages are no longer being maintained. This section of the website has been replaced by the First Ladies' Library Blog. Please click here to visit the blog for the newest articles. One fact almost always misunderstood about First Ladies and the outfits they wear to the Inaugural Ball is that this event has not been continuously held before 1949. From George Washington inauguration as the first President in 1789 until Franklin D. Roosevelt's fourth and final one in 1945 only 14 First Ladies attended Inaugural Balls (and thus, wore gowns): Dolley Madison, Elizabeth Monroe, Louisa Adams, Sarah Polk, Harriet Lane (niece and First Lady of the only bachelor President), Mary Lincoln, Julia Grant, Lucy Hayes, Lucretia Garfield, Frances Cleveland, Caroline Harrison, Ida McKinley, Edith Roosevelt and Nellie Taft. This was because of one of several potential factors: wives who did not live to see their husbands inaugurated as Presidents, wives who chose not to attend the Inaugural Ball or wives whose husbands did not want a Ball to be held. It is only since 1949, with the Inauguration of Harry Truman that the tradition has remained a consistent one and so 11 different First Ladies have had Inaugural gowns (6 of them had two gowns each for their husbands' two inaugurations - Eisenhower, Nixon, Reagan, Clinton, Bush and Obama). Of course, Betty Ford never wore one since her husband became President upon the sudden resignation of Richard Nixon in 1974. Although Bess Truman and Lady Bird Johnson did wear one each after their husband's election to their own terms and thus Inaugurations as President, they did not, of course, when first became First Ladies upon the death of President Franklin Roosevelt in 1945 and assassination of President Kennedy in 1963, respectively. I am certain that you will be able to find public domain photographs of these 25 different First Ladies in their Inaugural gowns by doing some deep online searches. The historical gowns mentioned in the first paragraph will likely appear as images on mannequins where an older Smithsonian exhibit had them displayed. Pictures (and possibly footage) of those from Bess Truman to Laura Bush should be available online at the websites of each of their husbands' presidential libraries and museums, and for Mrs. Obama at the White House website. I had begun to gather many of these images myself for a scheduled online exhibit at my personal website (not on the official NFLL website) but unfortunately these, along with thousands of others, were lost with a hard-drive crash of my pc four weeks ago and it still remains uncertain when or if any of it can be saved. If it does prove possible to retrieve them and these files have not been harmed, I could share them with you - but at this point it does not looking promising, so the technicians tell me. I am able to discuss facets of Inaugural history and the First Ladies roles within it but not to discuss particular detail elements about their clothing styles - unless it affected political or popular culture (Ida McKinley scraping her plan to have a gown of Belgian lace and instead have one made with American products only and her use of an aigrette feather which provoked rebuke from the Audubon Society, or the cost of Nancy Reagan's 1981 gown at a time of economic recession becoming a political problem, for example.). How have First Lady hairstyles affected public trends? In earlier periods the influence was greater. Now news is so broken into so many specialized interest categories that the general public might never see or hear anything about a First Lady unless they wanted to, or searched it out. Actors have as much influence on trends, if not more, than do First Ladies. In the recent past certainly nobody had as massive a global influence on hair styling as did Jackie Kennedy. There were even booklets printed to give women specific instructions on how they could achieve the “Jackie Look” for themselves. There was one other who had as much influence – Frances Cleveland who, at 21 years old, married the bachelor 54-year President in the White House. She shaved the back of her neck clean and wore her longer back hair up, and stories told of how college girls went insane for this and droves of them got their “a la Frankie [her nickname]” haircut. -Most controversial First Lady hairstyles and why? Not sure I’d call any of them controversial. Many people were in wonder about Mamie Eisenhower’s insistence on wearing bangs over her forehead – she came in with them and left with them, never changed them. She had the famous Elizabeth Arden draw up rigorous detailed drawing on how it was all to be done, like a feat of mechanical engineering. Men and women wrote letters to major national hard news magazines criticizing, praising, and being bewildered by the “Mamie Bangs,” but they eventually became popular with many women by the late 1950s who copied them and some novelty company even made fake paper bangs people could buy and stick on their foreheads as a gag gift. Kennedy. It was not unlike all the other aspirational advertising going on in that Jet Era of the late 50s and early 60s. It was emulation. She was powerful and influential even with her husband, lived in the presidential mansion, spoke several languages, was a patron of the arts and knowledgeable about both popular and classical culture. People thought that if they copied her hair and her clothes they could be “just like” her. In fact, many of the movie and gossip magazines of the era even promised that “Be Your Town’s Jackie Kennedy,” one article title ran. Even if her hair style was not naturally adaptable to a person, they still insisted on getting it coiffed like her – to be like her. -If First Ladies change their hair frequently does it send a message? The only person I think this would even remotely apply to was Hillary Clinton. And she did change her hair cut and style several times during her eight-year incumbency. I tend to think people tried to read too much into this. She said she just liked to make sudden changes and refresh herself. And it did seem to correspond with different chapters in her time, from leading the effort for health care reform, to focusing more on international issues, to then running for the Senate when her hair was cut very short. She had a great quote about this: “If I ever want to get Bosnia [the controversy about whether the U.S. should involve itself in Bosnia’s internal conflicts and to what extent] off the front page, all I have to do is change my hairstyle.” She was always the same core person – but some critics said, aha, this is a sign of someone who doesn’t know themselves….and then she became the only First Lady in history to be elected to political office. -Do First Ladies every get riskier with their style/hair the second term of their husband's presidency? -Advice for Michelle Obama this term style-wise? Wouldn’t dare offer anyone advice on personal stuff like that, let alone someone who knows what works best for them. More than anything, every individual has to find what they feel most comfortable looking like and ignore critics, because there will always be critics. The Inaugural ball is one of the First Lady's first appearance in her official title. Obviously, what she wears has to be carefully planned. What sort of messages have First Ladies sent to the public with their choice of dress, over the years? In truth, what they’ve chosen to wear has been more an indulgence of their personal taste, a moment of extravagance for what are usually middle-aged women who, after their weddings, have had less grand, official and public moments to dress in the most elegant, elite manner possible. So Ida McKinley, for example, was fascinated by the effort involved in women sewing intricate lace and wanted an Inaugural gown heavy with lace – and her two Inaugural gowns are perhaps the richest and most extravagant of all. Mamie Eisenhower loved the color pink – a very specific sort of Pepsodent Pink and so her gown with several thousands pink crystals beaded onto pink cloth was a matter of personal taste, even though it sent an image of a woman who, despite being a grandmother, was still youthful enough to show off her bare arms and neck and shoulders and also had the effect of displaying a color so appealing to both men and women that the color became among the most popular throughout the decade of the 50s. I think some have perhaps drawn far too much analysis from what First Ladies wear – it isn’t always so calculated to send a political message. I mean one can say that Lady Bird Johnson wore a yellow gown with a yellow coat as some sort of symbolic “Yellow Rose of Texas” as an emblem of her pride in Texas – but, in fact, she just really liked the way she looked in yellow. I mean Barbara Bush loved the color blue and dressed in it not just for the Inaugural Ball but most times – and yet blue is the so-designated color of the states which voted against her husband. The only two examples I know of where there was a conscious and specific message that might have been conveyed were the gowns of Caroline Harrison in 1889, who had an acorn sewn into the ornate design on the back of her dress as the symbol of her state Indiana, and Rosalynn Carter who wore the blue gown she had worn to her husband’s inauguration as governor of Georgia for sentimental reasons – and not as a sign of economic budgeting of family money, as many incorrectly interpreted it. Historically, how has the First Lady's inaugural ball appearance--her dress, hair, etc--shaped her public image for years to come? The images which emerge from the first Inauguration Day of a new First Lady are perhaps the single most important factor in the casting of her public image, as in literal image – the lingering, permanent visual impression of them in the mind of the public. What is interesting is that along with the visual image what has been written about that visual image has also become part of the predominant, determined impression of them. What I mean is that at the very first Inaugural Ball in 1809, writer Margaret Smith left a vivid word description of the color and textures of the cloth and head turban worn by Dolley Madison, adding that she appeared to be the very ideal of an American Queen. The description plus the interpretation of what she saw has become institutionalized into the general public’s idea of what Dolley Madison symbolized. From the time of Mary Lincoln until Mamie Eisenhower, about 90 years, the formal photograph taken which captured the Inaugural Ball appearance of a new First Lady also served as the first of the “official” White House photograph portraits released of a First Lady (as the years of the first and perhaps second term went on, the image would be updated to a more current one, yet the image which still dominated was still that very first one. In some respects, the Inaugural Ball appearance of a First Lady is less important than it was 50 years ago in establishing the public impression of her. As television and color photography and the more direct public involvement of First Ladies in the events of their husbands’ Administration’s increased, there were other more compelling impressions. For example, Jackie Kennedy giving her television tour of the White House in a red suit, Pat Nixon touring Communist China in her bright red coat, Hillary Clinton campaigning for the U.S. Senate in her light blue pants suits – all of these visual images and the incidents associated with them became more important in defining the permanent impression of those women than did their Inaugural Ball appearances. Which First Lady do you think had the most successful Inaugural Ball style, in terms of how it helped convey her husband's politics, as well as the economic environment at the time? Since not all Presidential Inaugurations were marked by an Inaugural Ball and not all Presidential wives attended those balls which were held, we’re only talking about a pool of 23 women – only half of the total number of First Ladies (Dolley Madison, Elizabeth Monroe, Louisa Adams, Sarah Polk, Mary Lincoln, Julia Grant, Lucretia Garfield, Frances Cleveland, Caroline Harrison, Ida McKinley, Edith Roosevelt, Helen Taft, Bess Truman, Mamie Eisenhower, Jackie Kennedy, Lady Bird Johnson, Pat Nixon, Rosalynn Carter, Nancy Reagan, Barbara Bush, Hillary Clinton, Laura Bush and Michelle Obama). I’m afraid I’d have to say that none of the Inaugural Ball gowns of these First Ladies really managed to convey the policies of their husbands or reflected economic downturns, or wars or other crises – this event is the one night when they are almost entirely removed from those considerations and reality. The point at which First Ladies’ clothing began to take on political consequence is more the established patterns of their spending in economic times and the cost – Mary Lincoln during the Civil War, Jackie Kennedy buying and wearing those from foreign designers, Nancy Reagan receiving gifts of free couture clothes during the 1981 recession, but not really Inaugural gowns. There was also the came of Frances Cleveland, in her young 20s who wore shoulderless gowns and the Women’s Christian Temperance Union petitioned her to please stop doing this because it was a bad moral influence on the young women of the nation. Rosalynn Carter famously wore an outfit she had already previously worn to her husband's inauguration--something Michelle Obama has been applauded for doing. Why do you think it's important for First Ladies to re-wear garments in times of economic downturn? It’s not only immediate evidence that the President’s own family is understanding what the majority of the country is enduring in the most personal lifestyle matter, but it is also immediately visible. It is tangible proof. It is speaks to an old American value of thrift – of respecting money and not spending it needlessly, just for the sake of spending it. And even though it is a personal matter to her, it reflects on the type of thinking in the President’s household. It also gives proof that their personal vanity is not a personal priority. That helps diffuse any charges of egotism. In the late 70s, Betty Ford announced that her family would be eating more fish and chicken and casseroles as a way of dealing with inflation and her office even gave out price-busting recipes – but it was their word, it wasn’t tangible and being seen in the same clothes does not need explanation or won’t come off as trying to make a point. It makes the point obviously but silently. For her husband's inauguration Jacqueline Kennedy wore a dress she actually helped design with Bergdorf's Ethan Frankau. What do you think this conveyed to the public about her? Did it foreshadow her public image as a style icon? The public did not widely know this fact at the time. Even though there was intense fascination and even fighting among the clothing industry press to get copies of drawings of what she might wear, the way the press release about her gown was written, it didn’t make it explicit just how central a role Jackie Kennedy had been in designing her own gown. Not until years later, even after her death, that sketches from her youth began to show her talent and skill for design. And later when her designer Oleg Cassini, known as a costume designer in Hollywood and not general high-fashion clothes for sale to the public, published his book, he revealed the memos and detailed notes she sent him about what she wanted for different state dinners or foreign trips. As someone who wrote a full-life oral history biography of her (my book’s title isAs We Remember Her Jacqueline Kennedy Onassis in the Words of her Family and Friends) I would have to say that everything about her “style” was entirely rooted in her substance – her knowledge of history, for example wanting a gown that looked like those from Ancient Roman friezes to wear for a dinner honoring those in the fine and performing arts, or in shades of oranges, yellow and pink for her trip to India where she knew that those colors had cultural significance. Even though the public didn’t know – or might not have even cared – about any of this at the time, they did detect something significantly unique about her clothes and it was the fact that she often had a direct role in designing them for herself. She was extremely talented in so many fields, intellectual, visual and artistic, even in terms of human behavior, which she put to good use in offering to the President her analysis of world leaders and powerful people. Both Laura Bush and Hillary Clinton chose to wear hometown designers for their husband's inauguration. What is the significance of this? What were they trying to convey? I must honestly say that I don’t know that there was significance other than a) they liked the designs these designers proposed to them and b) they thought the exposure might help their careers. I believe in the case of Michael Faircloth and the woman who designed Hillary Clinton’s first inaugural gown and whose name escapes me right now…they were both young and entirely unknown clothing designers, both working from the native states of these two governor’s wives, and not from the New York industry – and so it was a way for these two women to perhaps give their fellow Texan and Arkansan some media exposure which would hopefully lead to more commissions and help them to make a living doing what they loved. Both Laura Bush and Hillary Clinton also chose to wear Oscar de la Renta to the inauguration of their husband's second term. What is the significance of this? How come they decided to make the switch from little known designer to big name designer? No idea on this one – would have to be so wildly speculative an answer, I’d be a fool to even guess. In thinking about this subject I have to immediately let you know that I am not in any way versed on matters of clothing of the First Ladies except in the political symbolism and the socioeconomic status they may represent in terms of currency and cost. I think your work on Edith Wilson especially merits study, however, because she was one of those who spent an inordinate amount of energy on her clothes, particularly, and public appearances generally. Apart from a vanity that seems apparent from not only her private letters but in her public memoir, I believe she very much equated the role of First Lady at the time of her tenure as did many of the Washington elite and general population: a form of Yankee royalty. Certainly the effort she made in her public appearances in Europe with the royal family members of England, Italy and Belgium suggest a hyper-consciousness about maintaining this status and keeping it on par with the Europeans: in that instance, I don't believe it was purely a motivation of personal vanity but a patriotic sense of truly embodying her own nation and asserting that the United States was on equal status with the powers of the old world. That very first trip by an incumbent President and his wife to Europe at the end of World War I was an important one in terms of policy as well as symbolism. It was the first time that Europeans gave sustained and serious attention through their media on Americans, generally, and the President, particularly. As far as the notion of her developing a sort of "power suit," I am more hesitant to affirm only because my understanding of that term applies to women in Washington who wield their own independent power more than that of derivative power through marriage - the First Lady, and spouses of the Vice President, Cabinet, Senate and House, Supreme Court and diplomatic corps excepted. Also my understanding of the term "power suit" derives from official life in Washington since the 1980's with figures like Nancy Reagan, Elizabeth Dole, Hillary Clinton, Nancy Pelosi, Lynne Cheney, Tipper Gore, Nancy Kassenbaum as examples. These women have had the dual need to present a traditionally feminine appearance with the flexibility of a packed day of meetings and often air and train and car travel - thus practicality. They began wearing increasingly shorter dresses and pants. In terms of style - and again, I am no expert at all, or even an astute observer. I also know that Mrs. Truman was actually criticized for wearing no variations from her skirts in the mid-1940's that were measured a certain length from the floor with matching shorter-sleeved jackets in navy blue, grey and black only. Mamie Eisenhower wore the same suit style but in lighter colors. Jacqueline Kennedy updated this slightly with eye-popping monochromatic colors for the new technology of color television. Her famous pink suit worn when the president was assassinated is the most famous example of this. Tying this together, I know that Mrs. Reagan, and other women of power or married to powerful men in Washington of the 1980's, were shown to be wearing the same type of suit as Mrs. Truman, Eisenhower and Kennedy. So, with her skirts that never showed more than her ankles and, as you say "asymmetrical lines", Edith Wilson seems more of person who followed the current vogue of her era rather than set a tradition, consciously or unconsciously. Please take all of that with the over-riding fact that I am not in any way an expert on this aspect of First Ladies except as it turned up as a cultural statement for a particular era or, mostly, had a political impact or repercussion. I think this may be a really new field of study within the still-new study of First Ladies. All too often, I believe, First Ladies have been reduced to "fashion mannequins" thus making them of interest to a limited audience; I think your perspective on the subject can give it a genuine relevancy and widen its interest. With regard to First Ladies' most outrageous outfits, there are several instances of First Ladies' wardrobes causing controversy. One prime example is a story about Ida McKinley scandalizing in Turkish pants outfits, but this is not based in fact. I have done perhaps more extensive research on her whole life in preparation for what will eventually be published as the first full-length biography of her life and nowhere is there any claim of accuracy - and obviously no documentation - on her wearing these pants. Perhaps it was done as a satire - I know that H. L. Mencken famously cracked that Millard Fillmore's only accomplishment was installing the first White House bathtub, and for almost 80 years now, it still circulates as "fact"! Below are several other outlandish stories involving fashions of the First Ladies. I do recall that early in her husband's tenure as president, Mrs. Reagan wore black knickers with a dress, which generated lot of controversy, but I haven't done further research on it - though I seem to remember a story about it at the time in the Washington Post. Jackie Kennedy wore a leopard coat that is credited, unfortunately, with setting off a trend that seriously depleted the worldwide leopard population. One of the women's magazines, I think it was Ladies Home Journal, often had a big cover story and profile of an incumbent First Lady after she'd been there for a few years and often accompanied by a spread of them in new styles, etc. This is where Pat Nixon first appeared wearing pants - the first First Lady to do so. I seem to recall that it was an issue in the re-election year of her husband, which would be 1972. There is also a great story of how Frances Cleveland unwittingly expedited the demise of the bustle dress in either the late 1880's or mid-1890's (she was First Lady from June 1886 to March 1889 - she married the incumbent President in the White House and he was defeated for re-election - and then returned from March 1893 to March 1897 when he came back to defeat Harrison in their second face-off election and served a second full, though non-consecutive term.) In any event, as the young bride of a President and then as a young mother of three young daughters (one of whom was the only child of a President actually born in the White House) she was enormously popular and her clothing style was copied by many other women. Two reporters in Washington during the summer apparently were hard-pressed for a breaking-news story and completely made up the claim that Mrs. Cleveland didn't like the bustle and would no longer wear it when the forthcoming social season began that fall. The story moved fast - and women by the thousands apparently abandoned the bustle too. Along those lines, Frances Cleveland wore many gowns that showed off her bare neck, shoulders and arms - (sleeveless I think is the right term). It alarmed the Women's Christian Temperance Union and they actually drew up and had their various branches copy a petition, then sought to get all its members to sign it, asking the First Lady to stop wearing these dresses because it corrupted the morals of young women who copied her. She kept wearing them. Mary Lincoln liked to wear ball gowns with very long trains but also without shoulders and President Lincoln once remarked that he thought she needed "a little less tail and little more neck" instead. She was also known for wearing elaborate head-dresses of multiple roses, and in a letter to his wife, one Senator described Mrs. Lincoln critically, as wearing a "flower-pot" on her head. Eleanor Roosevelt was famous for sometimes running from one task to another, from private life to a public event at the White House, and on occasion shocked people by showing up wearing her hair net or a white head scarf tied in her hair which looked like a rag of sorts. I cannot recall the specific person who either stated or wrote about Julia Grant who wore the heavily beaded, embroidered, laced, tasseled and ribboned gowns of the Victorian era, but she was sarcastically described as looking like a piece of a furniture set. In contrast, her successor, the highly moralistic Lucy Hayes wore clothes that covered her entirely to her wrists and neck, and wore her hair simply parted in the center with nothing but a Spanish comb and reporter Mary Clemmer Ames mused whether the "world of Vanity Fair" would "paint and powder" her image in magazines - and compared her beatific expression and simple style to the Mother of Christ. Finally, there is a famous story which Dolley Madison's nieces enjoyed telling about her. As a former Quaker, Dolley Madison had been raised wearing the modest clothes and bonnets in somber colors which covered her face and body, intended not to draw but deflect attention from her. Once she left the faith, she began dressing in the most current styles of her era, including the low-cut flimsy dresses of the Napoleonic Era. When, at the White House, she recognized one of the members of the public who attended her weekly open house reception as being a fellow - and former - member of her Quaker meetinghouse, she exclaimed to him, looking at his bare head - "Brother, where is thy broadbrim [hat]?" He looked at her exposed upper chest and neck and retorted, "Sister, why is thy kerchief?!" The whole issue of how much skin is "socially acceptable" to show in public by First Ladies has been ongoing from almost the start of the presidency. When Dolley Madison famously wore her low-cut dresses that showed off her shoulders and the top of her bosom, former First Lady Abigail Adams snidely remarked in a private letter that Mrs. Madison looked like "a nursing mother." There was a famous anecdote about Dolley Madison encountering an old friend who, like her, had been a Quaker, but left the faith. She looked at his head and saw he was no longer wearing the large black hat that Quaker men traditionally did (like the fellow on the Quaker Oats box). "Brother," she asked, "where is thy broadbrim?" He looked at her gown without sleeves or neck and with plunging neckline and quipped back. "Sister, where is thy kerchief?" Some forty-five years later, when Harriet Lane - the niece and White House hostess of the bachelor President James Buchanan (and the first to be called "First Lady") popularized what was called the "low-neck lace bertha" it set off something of a popular style - yet when her immediate successor Mary Lincoln wore shoulderless, armless dresses, she was criticized as "showing off her bosom." When Frances Cleveland, the 21 year old bride of President Cleveland, wore gowns without sleeves and showed off her shoulders, the Women's Christian Temperance Union circulated a petition pleading for her to cover up her skin because she was a bad influence on the morals of young American girls. In the Twenties, Florence Harding wore some evening gowns that bared her shoulders - despite her being 60 years old - keeping current with the vogue of the Jazz Age, but she also carried capes and wraps so she could cover up when she wanted to. Grace Coolidge frequently wore evening gowns in the flapper style - without sleeves. She is wearing a sleeveless red dress in her White House portrait - which you can find online at the White House. Bess Truman and Mamie Eisenhower sported what was then called 'the new look" of the post-war era and frequently wore shoulderless and sleeveless evening gowns - and received no criticism or even snide remarks, despite being in their late 50's and early 60's. In fact, Mamie Eisenhower is I believe the only First Lady who wore a sleeveless, neck-less gown to her husband's Inaugural Ball in 1953 (in her famous "Mamie Pink") and then again in 1957 (in yellow/gold). Mamie Eisenhower also sported sleeveless dresses at the end of her tenure, in the late 50's and early Sixties, reflecting the newer style for women's clothes - and, of course, her successor Jackie Kennedy helped to widely popularize this style. Jackie Kennedy also wore numerous evening gowns in bright and pastel colors that were sleeveless and shoulderless. 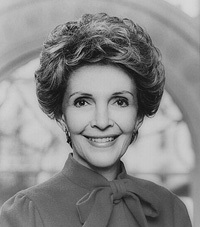 In recent years, Nancy Reagan often wore sleeveless and shoulderless evening gowns to state dinners, but during the daytime dressed more formally and covered. What does all this mean? Nothing really - except they wear what they feel comfortable wearing. My area of expertise on First Ladies is focused largely on their political impact, speeches, media relations, policy interests and symbolism. I only have the most limited scholarship on what they wore. However, there are some individual presidential spouses I have conducted indepth research on of whom I've written full-length biographies and there is some information I do know. Probably the best possible source on Jacqueline Kennedy will be the catalogues of her personal items that were sold at the famous Sotheby's auction in 1996. Perhaps the John F. Kennedy Library in Boston has a copy: not only detailed descriptions but color illustrations of the items. In doing some general research, I also find items that are now in the museum collections of various presidential libraries and museums: a locket with a miniature painting (I can't make out the scene) given by her husband and worn by Abigail Adams during the long years of their separation while he was serving as a diplomat following his years in the Second Continental Congress. Julia Tyler, widowed for nearly three decades, wore a painted miniature of her husband, clasped at her throat. 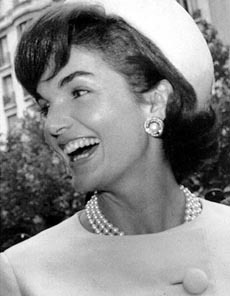 As First Lady, she also wore a pearl and diamond string of some kind as a "diadem", apparently a type of headband. You can actually see her wearing it in her official White House portrait. Sarah Polk, widowed for nearly a half a century, always wore an ivory carved cameo of her husband. Mary Lincoln seemed especially fond of a black onyx set of earrings, bracelet, ring, necklace, and pin (it seems to be set with diamonds as well) which she was actually photographed wearing for pictures she gave permission to be released to the public. Julia Grant most especially loved very green emeralds, very blue sapphires and very red rubies - I believe this is from a contemporary newspaper account of the Victorian era, but like so much written by others (as opposed to documentary evidence from photographs) it may not be true. 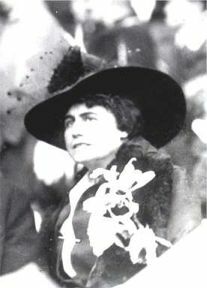 Ida Saxton McKinley was known to be a jewelry collector, most especially diamonds. Her father and grandfather had begun the habit of giving her diamond rings, bracelets, and it was the foundation for an extensive collection she built over her lifetime. She also seemed to collect jewels that had not been cut or set in metal and kept them in a simple bag that she enjoyed giving to visiting children - to play with! Nellie Taft also enjoyed diamonds and wore thick neck collars and matching thick (wide) bracelets - almost looking like they were shiny clothing cuffs. She was most famous, however, for her diamond tiara, which she was photographed wearing in the White House. Florence Harding always wore a thick black velvet neckband to cover her wrinkles and the Christmas following her husband's 1920 election, he gave her a large diamond sunburst - as it turns out, unknown to her it had been chosen for him by her best friend, the heiress Evalyn McLean who owned the Hope Diamond. Mrs. Harding in her white diamond sunburst at her neck, and Mrs. McLean with her legendary blue diamond at her neck often appeared together wearing these famous objects. The wedding ring which incumbent widowed President Woodrow Wilson gave to his second wife Edith Bolling was fashioned from a gold nugget given to them by western state citizens. Eleanor Roosevelt owned a blue aquamarine ring given her by the government of Brazil which she turned over to the federal government since it was a state gift. Mamie Eisenhower was famous for often wearing beautiful costume jewelry, and even pieces from discount stores such as J.C. Penny's and Woolworth's. As a widow, she was rarely photographed without her colored-glass U.S. flag pin. Finally, although she was not as closely identified with it as was Barbara Bush with her three-strand fake pearls (which were copied by several companies and sold as "First Lady Pearls"), Nancy Reagan wore a large and wide gold necklace and bracelet in the latter years of her tenure: she was often photographed in the matching items and even addressed the United Nations in 1988 wearing them. This request for information was a multi-part question: According to the Wash Post, Pat Nixon had a beauty salon installed in the White House, Nancy Reagan renovated and expanded it. I have heard that Laura Bush had it removed but cannot verify. Do you know anything about this? While it's hard to put an exact number on any of the dresses worn by First Ladies since they are frequently donated or provided at a great discount, do you have some sense of what might be the most extravagant Inaugural wardrobe worn by any of the First Ladies? Based on what I can find, it seems like it might be a tie between Laura Bush in '05 and Nancy Reagan in '85. Any thoughts on this one? It might be fun to include Rosalynn Carter in our story, since she was so refreshingly frugal compared to many other First Ladies. I am wondering if you know of any quotes or anecdotes about her specifically as they relate to fashion, beauty or style? Carl Sferrazza Anthony's response: I believe Nancy Reagan's Inaugural trosseau may have proven to be the most expensive in terms of 1981 and then 1985 US currency. A lot has been written on this topic and you may find some factual information that is reliable in the otherwise unreliable Kitty Kelly biography of the First Lady. Kelly's tone is acrimonious but she did punctuate her work with some substantive factual research and I believe information on the Inaugural clothes can be found here. You might also consult the fully-reliable Make-Believe, by Laurence Leamer; it covers the 1981 Inaugural. As for Rosalynn Carter, the real reason she wore a "used" gown to her husband's 1977 Inaugural Ball actually had nothing to do with frugality and everything to do with sentiment: she had worn the gown to her husband's first inaugural ball following his swearing-in as Governor of Georgia, a moment she held as a highpoint personally and so, attached emotionally to the memories associated with that dress, she wanted to wear it again. She did own - and bring to the White House - a sewing machine, she wrote, but found little to no time to ever use it. Regarding your first question it is true that Pat Nixon accepted the supplies and machinery for a beauty shop that were donated to the White House by a cosmetology association, and she had them installed in a small room on the second floor, in the family quarters. Nancy Reagan did refurbish this - but beyond that, I don't know anything more. I do know that it did still exist during the Clinton years because I personally saw it, when I was invited into the private rooms. Caroline Harrison, and her daughter Mary Harrison McKee (who lived in the White House with her parents, husband and children and who later served briefly as White House hostess, from October 1892 to March 1893 from the time of her mother's death to the Inauguration of her father's successor) both had American-made gowns which they wore to the Inaugural Balls on 4 March 1889. 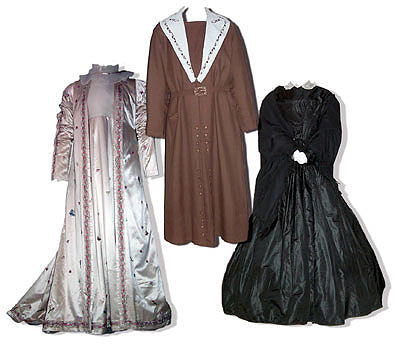 However, extant records of what was worn by previous and later presidential wives and hostesses to their President's Inaugural Ball shows they did likewise - although the further one goes back, the less clear are the details of these clothes. What made the two Harrison women's dresses of particular note was the effort to weave into the design a motif of a native American tree nut. I believe it was the acorn. The best source on this will be Jennifer Caps, the curator of the Benjamin Harrison Home in Indianapolis, Indiana. Incidentally, the museum there also has a large collection of the clothing worn by the Harrison family women and it might provide further clues. The James Garfield home and estate, "Lawnfield," in Mentor, Ohio, just outside of Cleveland, might be contacted for more information on whether or not Lucretia Garfield disliked what was originally a light purple colored dress which, I recall, faded fairly quickly in color. In looking at excerpts of her diary entry from the 1881 Inaugural Ball, however, I discovered that she focused more on the physical strain of standing and shaking hands for two hours with a crush of strangers at the Ball. I do not have access to the full and unedited version of her diary, however. That is located in the Lucretia Garfield Papers at the Library of Congress. The story that Edith Roosevelt "re-modeled" her clothes to rewear is a misnomer. She wearied quickly of the press inquiries for details on what clothes she would wear to particular events; she did not have a large collection of expensive clothes nor did she have an interest in spending one to accumulate one. Instead, over time, as press inquiries were made to her social secretary Isabella Hagner about the clothes, Edith Roosevelt had her witty and creative stepdaughter Alice Roosevelt simply offer vivid and different descriptions of the same piece of clothing Edith Roosevelt had already been seen wearing, changing the adjective preceeding a color, for example (blue, light blue, periwinkle blue, sky blue, royal blue, etc.) or the sheen, cut or length of fabric. In an age before photography became routine in newspapers, in this way the Roosevelt women managed to give the public impression that she owned and wore a larger clothing collection that she actually did - without technically "lying" to the press. The suit which Mrs. Kennedy was wearing at the time of her husband's assassination was sent by her mother in the months following that event to the National Archives in Washington. It is only in recent years that this has been formally acknowledged and the family has legally responded by deeding it as a gift to that repository. I believe there may be a condition, however, of some many decades before permission will grant any public display of the suit. One immediate thought - there were smaller, compact inkwell pens at one point. I am not sure if they existed in 1844-1845, but some of those I've seen from the 1890's could fold within its own tube so it was more of a short stub of a pen rather than the elongated one we think of today. Through the years I have seen a number of photographs taken of Julia Tyler; most of them are from her later years, as a widow. In no images of her, unfortunately - whether it be painting, engraving or photograph, does she seem to be wearing the pen. However, in 1987 I did unearth a forgotten dauggereotype that was made of her by an Anthony Studios in New York. She is actually holding a pen in that picture. Interestingly, this image is the earliest known photograph taken of an incumbent First Lady. As you probably know, she was 24 when she eloped with President Tyler - and she certainly looks it in this image. I used copies of the image in two of my books, First Ladies, volume 1, and also America's First Families. This image is also possibly available on the Library of Congress Prints and Photographs Division website.